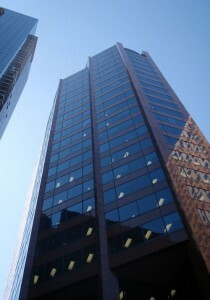 We completed a replacement contract for the HSBC tower in downtown Vancouver. 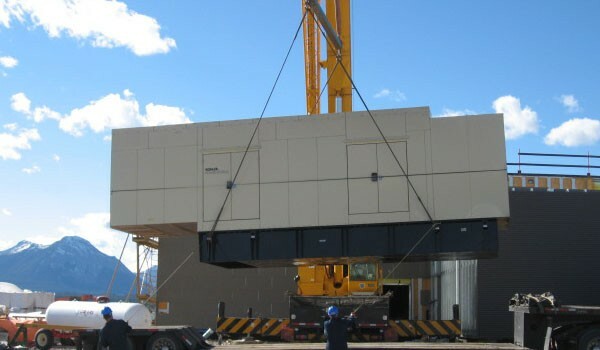 The building, managed by Cadillac Fairview, is supported by a 750 kWe emergency generator set providing backup power to elevators, fire pumps and other emergency systems. Under testing by an independent contractor, the generator set experienced a catastrophic failure. A piston seizure caused subsequent damage that broke a connecting rod and severely damaged the crankshaft and block of the heavy-duty, Vee-12, 34 liter diesel engine. 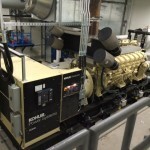 The generator set is located on the 27th floor, in a mechanical room on the roof of the downtown high-rise building. A freight elevator with a limited weight capacity provides service only up to the 24th floor. 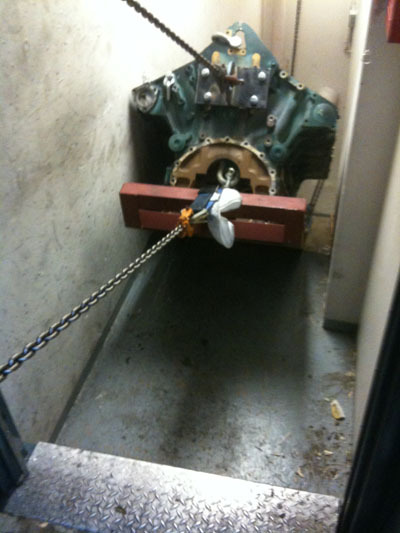 Moving a heavy 12 cylinder engine up the remaining three floors was a challenge. 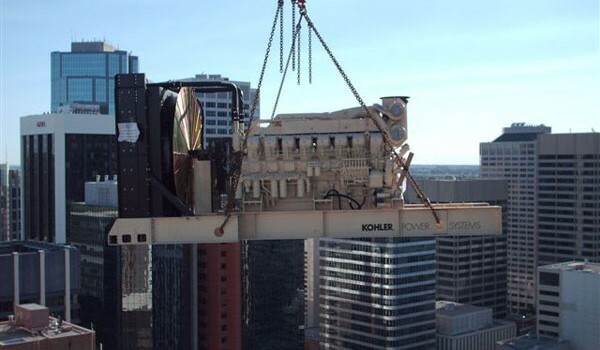 Not only did a new engine have to be moved into place, three stories above the elevator’s lift but the old engine had to be disassembled and completely removed. We were called in to assess the damage and to provide repair alternatives. Several options were considered, including using a helicopter to lift a replacement engine into place. 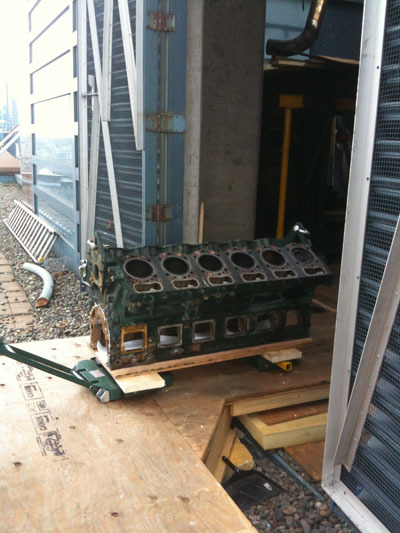 Ultimately the most economical solution was to replace the existing engine. It was a daunting task, requiring in excess of 600 hours of labour. We built a sled to slowly slide the heavy components down the stairs. Luckily, there were anchor points in the ceiling from a previous elevator motor replacement that we could use to lift and turn the crankcase for the next flight of stairs. We contracted Desa Construction to build a walkway on the rooftop to protect the roof membrane. Moving the crankcase along the walkway to the stairs using our special high capacity dolly. 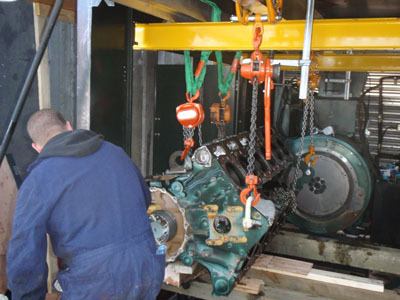 Rotating the 3,025 pound block using the twin I-beam setup to safely access the crankshaft. 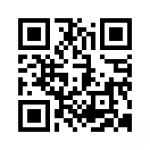 ← Other Interesting Projects . . .